In this month's issue; Priest Of Ishar Marco Conti presents a new hero for the Lone Wolf roleplaying game. Sustained by an unbreakable faith, they have the holy mission of guarding the peoples of the world from any threats Naar poses. Drops And Drop Capsules The Mobile Infantry have a particular way of deploying for battle. Find out now before you sign up with this in depth article explaining just what happens when the loading doors shut. Of Steam and Other Technologies The second instalment of this huge article detailing the world of OGL Steampunk. The world has known a great deal of technological advances over the centuries - this issue Alejandro Melchor swiitches his attentions to the occult. Fear Files: Cat Demons More from horror maestro Morgan Davie. If you ever looked down at the family moggy and got a strange look back this will put you off your sleep! Scenarios Of Shadizar Everybody says there are 101 things to do in a big city, and Vincent Darlage went out and did them all in Shadizar. Look in here to find out what he got up to and then annoy your Games Master to put some into your Conan adventures. 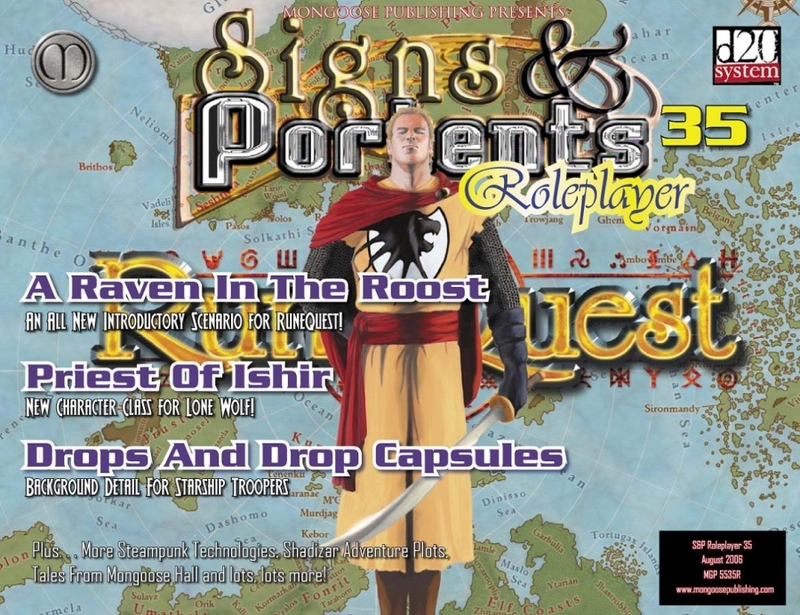 A Raven In The Roost To commemorate the release of RuneQuest we have this fantastic adventure from the pen of mongoose staff writer Bryan Steele. It looks like thereâ€™s trouble in the duck illage of Roost and the players are going to have to sort out out. Youâ€™re dealing with ducks, so you know RuneQuest is back!